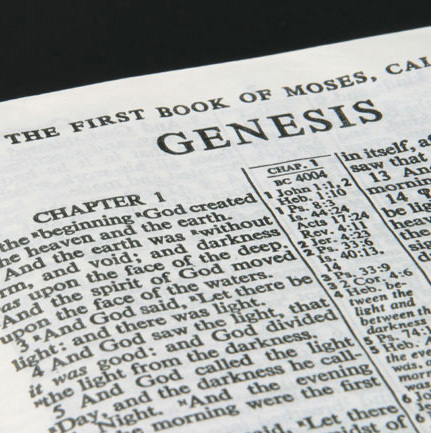 How did the book of Genesis come to be? We know Moses wrote it, but where did he get it? All the events in Genesis were history to him. Did he have access to historical records? Did written records even exist back then? Or did Moses write Genesis from oral traditions and passed down stories? Or perhaps he got it directly from God. Did God simply dictate it to him on Mt. Sinai? These questions and others may be answered in part by recent archeological finds and some seemingly peculiar phrases that occur all throughout the book of Genesis. There is little doubt among Bible scholars and commentators that the toledoth statements in the book of Genesis are an important key to its literary structure. The hebrew term, toledoth means account, record, genealogy, family line (KM Hebrew Dictionary). It’s often translated history, generations, or account. It occurs several times in Genesis and always seems to mark a major account division when found in particular phrases—”These are the generations of…”, “This is the account of…”, “This is the history of…” In addition, in most cases, a name of a patriarch is attached—for example, “This is the account of Noah.” The following is a list of every toledoth phrase found in the book of Genesis (NIV). It’s also significant that the word genesis, itself, is derived from the greek word for toledoth. It would appear then, the jewish scribes that translated Genesis into greek (The Septuagint (LXX)) believed this word to be so significant, they chose it as the title for the entire book.1 Had they been translating to english, it may have been known today as the book of Accounts, or Histories. That said, some mystery also surrounds this term. To the modern reader, the most natural way to look at a toledoth phrase would be as a subject introduction. One would expect the “account of the heavens and the earth when they were created” (2:4) to introduce an account of the creation of the heavens and the earth. One would expect the book of the account of Adam (5:1) to introduce an account about Adam. One would expect the account of Jacob (37:2) to introduce an account about Jacob. The problem is, they don’t! “This is the account of Jacob. After the initial introduction of Jacob, a long narrative about Joseph’s life begins. So why not call this “the account of Joseph.”? Why would a large account of Joseph’s life be titled, “this is the account of Jacob.”? Some commentators explain this by preferring the translation “generations.” Perhaps the toledoth statements are introductions of the generations which come from the patriarchs mentioned. Thus the toledoth of Terah would be about one or more of his descendants, as would the toledoth of Jacob. But this explanation doesn’t work consistently. The toledoth of Noah (6:9a), for instance, is followed by an account of Noah, and not of his sons. Other commentators understand the toledoth as introductions to genealogies. Both Adam’s and Shem’s toledoth phrases are followed by genealogies (5:1, 11:10), and the toldedoth of Noah’s sons is followed by the Table of Nations (10:1). But the majority are not followed by genealogies at all, in fact, most precede narratives. And, perhaps the most puzzling question of all, why doesn’t Abraham have a toledoth introduction? He is without question the most significant patriarch in Genesis. Yet there is no account of Abraham. The mystery deepens. Thankfully, a much better solution has come to light, particularly in the last century thanks to archeological discoveries. British Air Commodore PJ Wiseman deserves a debt of gratitude for looking closely at these discoveries and putting forth a new theory known commonly as the Tablet Theory or Wiseman Hypothesis. It was during this time Wiseman became familiar with some of the literary practices of ancient scribes—in particular, their use of colophons. Put simply, colophons are concluding remarks found at the end of written documents which identify the author or owner of the document, along with other important information. 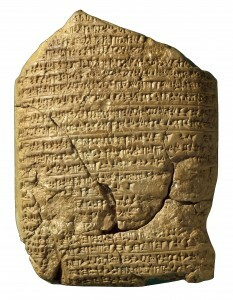 Wiseman noticed that most of the tablets discovered contained these concluding signatures, and soon made the connection between them and the Genesis toledoth. What if these phrases were not titles at all? What if they were concluding remarks per the literary customs of that era? And what if the names attached were not in reference to subject-matter, but rather authorship? 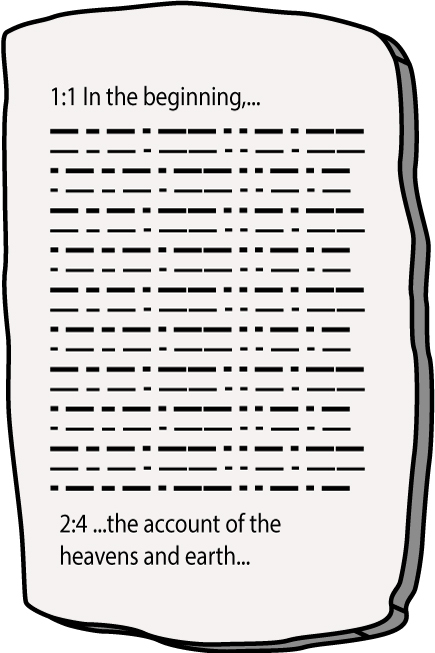 Take a look at the book of the account of Adam found in Genesis 5:1. Literally from the hebrew, “This [is] the account of the book of Adam.” A modern reader would tend to view this as an introduction to the genealogy that followed, but an ancient reader may have done just the opposite. He may have looked backward connecting it to the preceding account. And he may have looked at the name attached—Adam—as the original author/owner of that account. And this is the basic essence of Wiseman’s hypothesis. He proposed that the individual patriarchs attached to toledoth phrases were the original authors of the source documents Moses used. Thus, the “book of the account of Adam” was actually an account originally written down by Adam. Now one might immediately object that if Adam wrote a potion of Genesis how can it also be considered a book of Moses? Doesn’t this cast doubt on Mosaic authorship? Not at all, in fact, it supports it. For while the Bible is clear Moses was the author of Genesis, one might wonder where he got his information? The entire book was history to him. None of it happened during his lifetime. The only way he could have received it was from passed down historical records, or by direct revelation. And what do we make of this reference to a book in chapter 5? “This is the book of the generations of Adam.” Sepher, in the hebrew means book (as a scroll or tablet), scroll, letter, certificate, deed, dispatch (KM Hebrew Dictionary). If Genesis was really given directly to Moses from God, why would God reference another written account? But, if Moses used source material (under God’s supernatural guidance), it makes perfect sense. Moses was merely citing his source. But wait a minute! 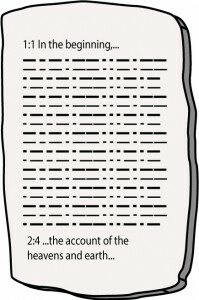 Moses was using a document originally authored by Adam? Did writing even exist then? Until the beginning of last century, the only known contemporary history which had been written earlier than 1000 B.C. was the earlier part of the Old Testament…. The idea that Moses or his ancestors didn’t keep historical records now flies in the face of what we know of that region and time. Record keeping not only existed, but was extant long before Israel came into existence. But Adam was the first human and lived before the flood! So what? Adam was created with the ability to speak the very first day of his creation. He was advanced enough to name all the animals of Eden, and even uttered the first line of poetry ever recorded! Hebrew poetry is based on parallelism, rather than rhyming words, and we first see this practice—bone of my bones and flesh of my flesh—the day Adam was created. In addition, Adam lived over 900 years (Gen. 5:5) as did most other antediluvians. Is it really hard to believe they developed a form of writing? Thus, according to Wiseman’s hypothesis, Moses composed Genesis from historical documents passed down to him from the specific ancestors named in the toledoth phrases. The primary pillars of his theory can be summed up in these three 3 basic points. (1) It is the concluding sentence of each section, and therefore points backward to a narrative already recorded. (2) That the earliest records claim to have been written. (1) In no instance is an event recorded, which the person or persons named could not have written from his own intimate knowledge, or have obtained absolutely reliable information. If the above assertions hold true, it will be difficult to deny that Wisman has made monumental progress toward understanding the toledoth structure of Genesis. Is this the same as JEDP? Absolutely not, it fact, it’s just the opposite. JEDP, also known as the Documentary Hypothesis, was first developed by critics of the Bible about 250 years ago, and then later made popular in the 19th century by Karl Heinrich Graf and his student Julius Wellhausen. For this reason, it’s also known as the Graf-Wellhausen hypothesis. It asserts that Genesis was not authored by Moses at all, but was composed hundreds of years later from 4 separate documents represented in the JEPD acronym. This of course flies in the face of numerous references to Mosaic authorship in the Bible, as well as solid jewish tradition which establishes Moses as the author. For more on contrasts between the Tablet Theory and JEPD, see, Did Moses Write Genesis, and The Tablet Theory of Genesis Authorship. Gen. 4:26 And to Seth, to him also a son was born; and he called his name Enosh. Then men began to call upon the name of the LORD. If the reader is under the impression chapter-verse markers are part of the original text, it would only be natural for him to read the book of Adam as a title phrase at the beginning of a chapter paragraph. But what if the paragraph break is slightly adjusted? Gen. 4:26 And to Seth, to him also a son was born; and he called his name Enosh. Then men began to call upon the name of the LORD. Gen. 5:1a This is the book of the generations of Adam. 1b In the day when God created man, He made him in the likeness of God. 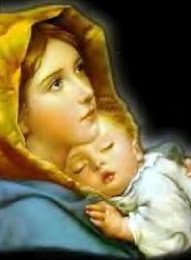 2 He created them male and female, and He blessed them and named them Man in the day when they were created. As you can see, a simple rearrangement makes a big difference. In the latter, the book of Adam (1a) appears to be a concluding remark at the end of an account, while the second half the verse (1b) starts a new account. And both of these arrangements are perfectly acceptable renderings from the original Hebrew. Only context can tell us which should be preferred, and this will be the real test for Wiseman’s hypothesis. In this next section, we’ll scrutinize Wiseman’s hypothesis by the text of Genesis, itself. We’ll examine each toledoth phrase, in context, to see if Wiseman’s claims can be validated. As is always the case, scripture must have the final say. Gen. 2:4 This is the account of the heavens and the earth when they were created. Furthermore, there is no toledoth statement preceding the creation account. This is definitely the conclusion of the first source document of Genesis (perhaps originally written on a clay tablet) which starts in Gen. 1:1 and ends with a concluding toledoth in Gen. 2:4. This particular tablet is unique in that it does not have a patriarch’s name attached to it. Why? Probably because the majority of the account contains events no man could have witnessed. If Wiseman’s theory is true, each toledoth patriarch would have been an eyewitnesses or had access to an eyewitness of the events recorded on his tablet. It would seem proper, then, for this first tablet to remain nameless. Perhaps God gave this account to a man to write down, but having not witnessed any of it himself, the man did not feel worthy to attach his name to it. All points considered it would seem this toledoth fits best as a concluding remark. The account starts in Gen. 1:1 and ends with the toledoth in Gen. 2:4. It covers the events of the entire creation week. Gen. 5:1 This is the written account of Adam’s line. Discerning the correct orientation of this next toledoth requires a bit more examination. It is followed by a genealogy which at first glance appears to be appropriate content for ‘the book of Adam.’ Also notice the NKJV prefers the translation genealogy, rather than account, seeming to link it to the genealogy that follows. Notice also this toledoth appears in the first sentence of chapter 5, giving it the appearance of a title. Could this be an introductory title sentence, rather than a colophon as Wiseman suggests? Actually there are some serious problems linking this toledoth to the following genealogy. First, why would a genealogy from Adam to Noah, be called a genealogy of Adam? Genealogies are lists of ancestors not descendants. They would normally be considered the possession of the last descendant on the list, not the first ancestor. 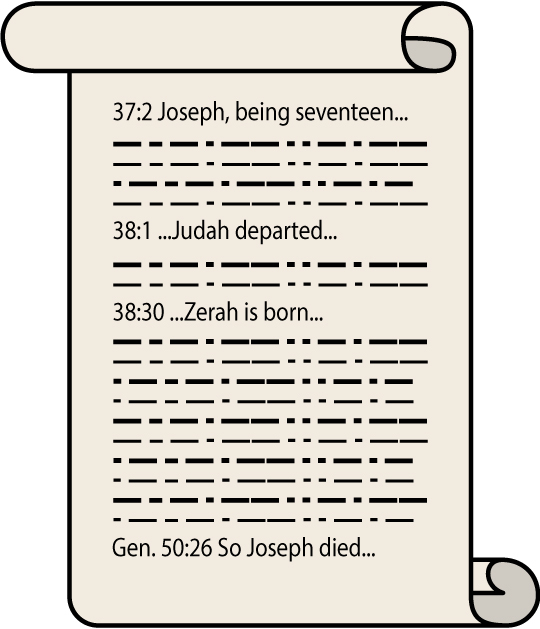 For instance, take a look at the Genealogy of Jesus Christ mentioned in Matthew 1. What follows is not a list of Jesus’ descendants, but rather his ancestors which link him to Abraham. Abraham is the first name on the list, and Jesus the last. 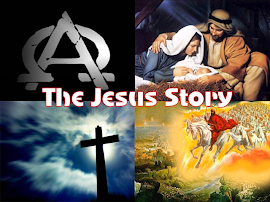 Abraham is the first ancestor, and Jesus the last descendant. Thus, this genealogy is rightly called the genealogy of Jesus Christ. 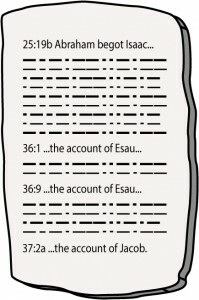 If this was the genealogy of Adam, we would expect to see a list of Adam’s ancestors, which, of course, he didn’t have. It is, rather, the genealogy of Noah who is the last individual descendant in the list, and, therefore, it is likely the start of a new account having nothing to do with Adam’s account. You’ll notice, also, that the NIV translation places a paragraph break between Gen. 5:1a and 1b. While they may not have had the Wiseman’s hypothesis in mind, this at least shows that a paragraph break is possible immediately after this toledoth phrase. Does this toledoth work as a colophon? What precedes this toledoth is a narrative of the planting of the Garden of Eden, the Fall, the murder of Abel, a list of Cain’s descendants (6 generations deep), and the birth of Seth. Just as Wiseman asserts, all of these events would have occurred during Adam’s 930 year lifespan. All could have been witnessed by Adam himself, or someone he had access to. And no other man but Adam directly witnessed events before the fall, and even the events that happened just prior to his creation, could have been made known to him by God whom Adam, originally, had direct access to. All points considered, the textual evidence seems to indicate that the book of the account of Adam is best understood as a concluding signature, and should be linked to the preceding account which spans from Gen. 2:5 to Gen. 5:1a. It was originally authored by Adam and covers the planting of the Garden of Eden, the Fall, Abel’s murder, Cain’s descendants and Seth’s birth. Gen. 6:9 This is the account of Noah. At first glance, this account also would seem to work as an introductory title, having content about Noah following directly after it. But as we discovered in the previous section, the account preceding it begins with Noah’s genealogy (not Adam’s). Also preceding this toledoth is the account of the sons of God (taking the daughters of Adam), the announcement of God’s coming judgement on the earth, and God’s extended grace to Noah. There’s no question Noah could have witnessed all these events personally. Thus, it would seem to work well as either an introductory or concluding remark. That said, there is one possible problem for the introductory view, specifically in the way the following account begins. If there is any hint of Noachian authorship in this phrase, this would be a peculiar way to begin his account. Generally speaking, righteous men don’t tout their own righteousness. But if Wiseman is correct that this is the beginning of the next account which was authored by Noah’s sons, the problem is disappears. For, while it’s unlikely a righteous man would say this of himself, it’s not unlikely that his sons would. Of course none of this would apply, if this toledoth is merely a subject introduction. Note also, in the NIV translation, that a paragraph break is inserted in the middle of verse (just as in the last toledoth), showing this toledoth is not necessarily linked to the narrative after it. And, finally, if our previous conclusions are correct, it would make sense that this account would follow suit, with each section having a concluding toledoth and no introductory toledoth. All points considered, the textual evidence seems to indicate that the account of Noah is best understood as a concluding signature, and should be linked to the preceding account which spans from Gen. 5:1b to Gen. 6:9a. It was originally authored by Noah and covers the sons of god controversy, the promise of God’s judgement on the earth, and God’s extension of grace to Noah. This toledoth is unique in that it has 3 names attached instead of just 1. All 3 of Noah’s sons are listed, possibly indicating a joint effort. All 3 would have witnessed the events preceding this toledoth up close and personal. They each lived approximately 100 years before the Flood, and in the new world afterward. They were eyewitnesses to the construction of the Ark, to events onboard the Ark, and to events in this account that occured after the Flood. And as mentioned earlier, it would seem appropriate for Noah’s sons to describe their father as righteous and blameless. In regard to Wiseman’s hypothesis, there could not be better candidates. But could this also have been an introductory statement? The NKJV again uses the translation, genealogy, no doubt with the table of nations in mind which immediately follows. Descendants of all three sons are mentioned in this table, which, at first glance, would seem to be linked to this toledoth. But the same problem arises here as did with Adam’s toledoth. Why would a genealogy of Shem, Ham and Japheth list their descendants rather than their ancestors? As discussed previously, genealogies are lists of ancestors. Furthermore, the Table of Nations already has a closing toledoth phrase! “Lines of descent” here, is translated from the Hebrew word toledoth. Literally, this reads, “These [are] the clans of the sons of Noah according to their accounts by their nations.” And unlike other toledoth phrases, nobody believes this one to be introductory. It is without a doubt the concluding toledoth for the table of nations, which strongly suggests the prior toledoth is not linked at all. All points considered, the textual evidence seems to indicate that the account of Shem, Ham and Japheth, Noah’s sons, is best understood as a concluding signature, and should be linked to the preceding account which spans from Gen. 6:9b to Gen. 10:1. It was originally authored by Shem, Ham and Jepheth and covers God’s calling of Noah, the construction of the Ark, the Flood and some events in Noah’s life after the Flood. As discussed above, there can be virtually no debate about the nature of this toledoth statement. It is clearly a concluding remark as context leaves no other option. It would appear, record keeping was common among the early postdiluvians, and perhaps someone in antiquity collected these accounts from the various clans of the earth and compiled them into the master account we know today as the Table of Nations. He then rightly attributed ownership to the “clans of the Son’s of Noah” rather than himself. Thus, the textual evidence indicates the accounts of the clans of Noah is best understood as a concluding signature, and should be linked to the preceding Table of Nations which spans from Gen. 10:2 to Gen. 10:32. They were authored by early postdiluvian clans of Noah, listing their respective family lines. Gen. 11:10 This is the account of Shem. This toledoth has the name Shem (alone) attached to it. It is preceded by the Tower of Babel account, and followed by a genealogy which links Terah to Shem. Again, at first glance it may seem appropriate to link this to the genealogy that follows, but, as discussed in toledoth 2 and 4, genealogies are generally lists of ancestors, not descendants. Since the last individual descendant mentioned is Terah, it should logically be considered his genealogy. And it just so happens the toledoth of Terah is listed at the conclusion of this genealogy, precluding it from being Shem’s. What precedes this toledoth is the Tower of Babel account where God confused the languages of the early postdiluvians who were building a city. But could this event possibly have been recorded by Shem? Didn’t this happen hundreds of years after the Flood? Actually Shem would have been the perfect eyewitness for this event. Many don’t realize, Shem lived 500 years after the Flood and outlived several generations of his descendants. He outlived Arphaxad (who lived 438 years), Shelah (who lived 433 years), Peleg (who lived 239 years), Reu (who lived 239 years), Serug (who lived 230 years), Nahor (who lived 148 years) and Terah (who lived 205 years). In fact, amazingly, if the genealogical data is accurate (and we believe it is), he was still alive when Isaac was born. Shem was a very unique character in human history, not only living on both sides of the Flood, but also on both sides of Babel and the creation of multiple languages. He also witnessed the lifespans of passing generations decrease dramatically after the flood, by 10 fold. We would be hard pressed to find a better chronicler of ancient events. Note also, in the NIV translation, that a paragraph break is inserted in the middle of verse 10, showing this toledoth is not necessarily linked to the narrative after it. All points considered, the textual evidence seems to indicate the account of Shem is best understood as a concluding signature, and should be linked to the preceding account of the Tower of Babel, which spans from Gen. 11:1 to Gen. 11:10a. It was originally authored by Shem and covers the events that happened at Babel. Gen. 11:27 This is the account of Terah. As mentioned above, genealogies are generally lists of ancestors, and belong to descendants. Terah is the last descendant mentioned in the preceding genealogy, and so it would be best understood as his. The account that follows Terah’s toledoth mentions the 3 sons of Terah, and then begins the long narrative of Abraham’s life. It would seem an odd title for the account of Abraham’s life, and this is perhaps the strongest evidence that toledoth are not subject introductions. Note also, the NIV here again, places a paragraph break in the middle of verse 27, showing this toledoth is not necessarily linked to the narrative after it. All points considered, the textual evidence seems to indicate the account of Terah is best understood as a concluding signature, and should be linked to the preceding genealogy, which spans from Gen. 11:10b to Gen. 11:27a. It was originally owned by Terah, and lists the ancestors that link him to Shem. Thus far, Wiseman’s hypothesis seems to be working seamlessly. Up to this point, Wiseman’s hypothesis has proved invaluable. All toledoth statements fit better as concluding colophons, and all the patriarchs mentioned are preceded by narratives which transpired during their lifetimes, making them eyewitnesses or giving them access to eyewitnesses. Unfortunately, some difficulties lie ahead, as we come across a few exceptions to our current formula. These have been a stumbling block, and caused many to abandon Wiseman’s hypothesis altogether (an unfortunately mistake as I’ll endeavor to show). Huh? Ishmael authored the account of Abraham? And herein lies the problem. Unlike the other accounts where the patriarch mentioned would have been a good eyewitness or had access to one, this one just doesn’t work. Ishmael was banished from Abraham’s household as a child, and would not have had access to good witnesses, nor would have the proper motivation to undertake such a task. There is precedence for sons writing their father’s accounts, such as in the case of Noah’s sons, but these were never estranged from Noah (at least not all of them). So are we now to believe that Ishmael kept a record of Abraham’s life and Isaac kept a record of Ishmael’s life? Clearly something is not right. Context is always key, and the context here seems to show a swapping of toledoth signatures. Can this somehow be resolved? The answer is, yes. There are 2 basic ways to explain this (the second being the right way, in my opinion). Option 1: We can read the toledoth of Ishmael and Isaac as subject introductions. Both are followed by accounts that would pertain to them. The toledoth of Ishmael is followed by information about his family line, and the toledoth of Isaac is followed by narratives of his life. But, as we’ve seen, it is very unlikely that toledoth phrases are ever subject introductions, and as we’ll see, this would cause as many problems as it solves. If both are introductory, this would mean Abraham’s account has no toledoth at all, which is extremely problematic. Of all the accounts in Genesis, you’d think there’d be an introduction for this one. And what are we to make of how well Wiseman’s hypothesis has worked until now? Do we just throw it all out and start over? Fortunately, there’s a simpler solution. Option 2: I believe Curt Sewell has found the key to solving this mystery. He considers the tablet of Ishmael to be a sub-tablet, which has been embedded into Isaac’s tablet. It would appear that instead of Moses working with separate tablets, the account of Ishmael may have been embedded inside of Isaac’s. Isaac, of course, would have been the perfect candidate to record all the events of his father’s life, and we know he also had contact with his brother, Ishmael, later on after Abraham’s death. “And his sons Isaac and Ishmael buried him in the cave of Machpelah… (Gen. 25:9) This would have been the perfect opportunity for the brothers to catch up and exchange histories, and it would seem appropriate for Isaac to include Ishmael’s family history in his father’s account. But why the change in structure? Why does Ishmael’s signature appear at the beginning of his account, rather than the end? Think about it. If Isaac was writing this account on a clay tablet which was the primary devise used in his day, how else could he indicate to his readers that his writings were ending and his brother’s was starting? There would have to be some way to indicate this, and perhaps placing the toledoth marker at the front of the embedded account made the most sense. Isaac’s signature would still have been at the very bottom of the tablet, indicating him to be the master chronicler of the entire account. Ishmael’s signature definitely could not have been there as that would imply him to be the master chronicler. And if he placed Ishmael’s signature directly after Ishmael’s account it would be right in front of Isaac’s signature, and there would be no way to discern where one account ended and the other started. But if Isaac simply moved Ishmael’s toledoth signature to the front of his account, the problem is solved (see diagram to the right). Isaac’s signature is at the very bottom of the tablet, identifying him as the owner, and Ishmael’s signature enables the reader to determine when his embedded account begins. While dogmatism is not possible, option #2 is definitely superior to option#1. All points considered, the textual evidence seems to indicate that the account of Ishmael is best understood as an introductory signature for an embedded account which is found in Isaac’s toledoth tablet. This small account spans from Gen. 25:12 to Gen. 25:18. It was originally supplied to Isaac by Ishmael, and briefly discusses his family line. Gen. 25:19 This is the account of Abraham’s son Isaac. As discussed in the previous section, this toledoth fits well as a concluding signature, if it is linked to the account of Abraham’s life that precedes it and includes Ishmael’s embedded account. Abraham’s account starts in Genesis 11:27b and ends in 25:11. 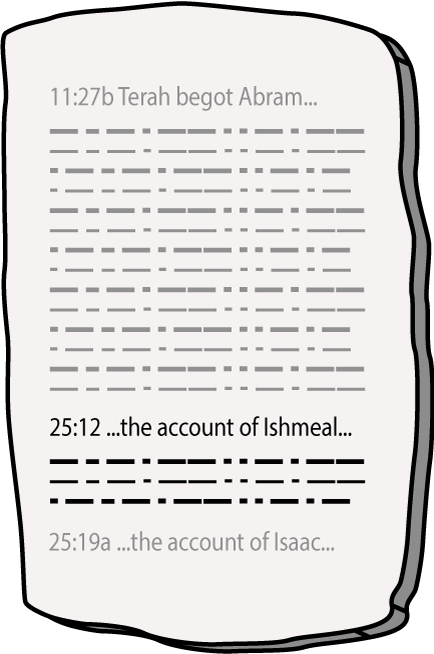 Ishmael starts in 25:12 and ends in 25:18, and Isaac’s signature ends this account in 25:19a. Isaac’s authorship of this entire master account (including Ishmael’s embedded account), fits perfectly within the principles Wiseman put forth. He had direct access to his father and would have witnessed a large portion of the account, himself. And he had contact with Ishmael later in life at his father’s funeral, where he could have obtained Ishmael’s records. There is also precedent for sons writing accounts of their fathers (Noah’s sons, and as we’ll discover shortly, Isaac’s son Jacob). Could it also be an introductory toledoth? An account of Isaac’s life follows, but, it soon turns to Jacob’s life, and eventually records Isaac’s death. That would rule him out as an author, but if it is merely a subject introduction, one might still wonder why this isn’t called the account of Isaac and Jacob. Why just Isaac? All points considered, the textual evidence seems to indicate the account of Isaac is best understood as a concluding signature, and should be linked to the preceding account which spans from Gen. 11:27b to Gen. 25:19a. It was originally authored by Isaac and covers all the events of his father Abraham’s life, and some of his own life. 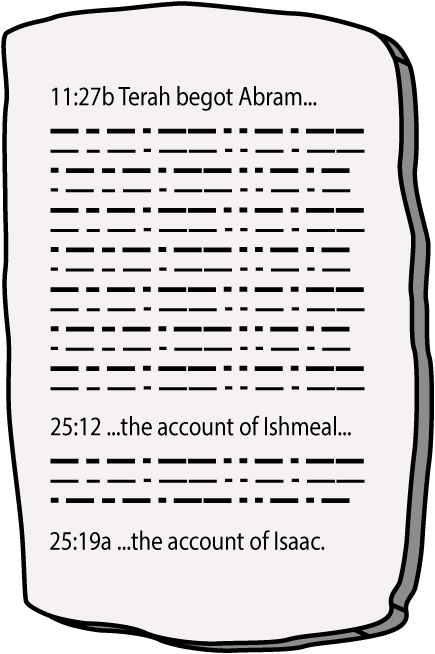 This account includes a small embedded account of Ishmael’s history at the end, spanning from Gen. 25:12 to 25:18. If our previous conclusions are correct, these next toledoth would also have to be considered embedded accounts. As was the case in Ishmael’s toledoth, it is highly unlikely Esau would undertake the task of chronicling his father and brother’s lives. Thus Curt Sewell also suggests these 2 accounts of Esau have likely been embedded into his brother Jacob’s account, which covers the life of his father Isaac. And just as Ishmael’s toledoth signature indicates where his account starts on Isaac’s tablet, so Esau’s signatures indicate where his accounts start on Jacob’s tablet. The first account of Esau is found in 36:1 and is a narrative of Esau taking wives and moving his family to hill country of Seir. The second is a list of his descendants, along with some lists of other descendants of other clans that lived in his land. How did Jacob acquire this information from his brother? We know that later in life, Jacob and Esau reconciled (Gen. 33), just prior to Isaac’s passing. Though Esau moved away, correspondence could have taken place, and written histories exchanged. All points considered, the textual evidence seems to indicate that both accounts of Esau are best understood as introductory signatures for embedded accounts which appeared at the end of Jacob’s tablet. The first account of spans from Gen. 36:1 to Gen. 36:8. The second from 36:9 to 37:1. These were originally supplied to Jacob by Esau, and discuss his move to the hill country of Seir and his family history there. Gen. 37:2 This is the account of Jacob. Gen. 37:2 These are the records of the generations of Jacob. Gen. 37:2 This is the history of Jacob. In this last toledoth of Genesis, we see Jacob’s signature at the end of another large account, spanning from Gen. 25:19b to 37:2a. As was the case with Isaac, Jacob would have been the perfect witness to record all the events in his and his father’s lives. His authorship of the preceding account fits perfectly with Wiseman’s hypothesis, if the 2 accounts of Esau had been embedded into his master tablet. Could this also be an introductory statement? Notice that in the translations above, all three place a paragraph break in the middle of verse 2, indicating this toledoth may not be linked to what follows. And notice what follows is not a narrative about Jacob, but rather an almost exclusive narrative of his son, Joseph. All points considered, the textual evidence seems to indicate the account of Jacob is best understood as a concluding signature, and should be linked to the preceding account which spans from Gen. 25:19b to Gen. 37:2a. It was originally authored by Jacob and covers all the events of his father Isaac’s life, and some of his own life. This account includes 2 small embedded accounts of Esau’s history at the end, spanning from Gen. 36:1 to 36:8, and 36:9 to 37:1. Now perhaps the biggest difficulty with Wiseman’s Tablet Theory is the fact that Genesis does not end with a toledoth phrase. The last account which is almost exclusively about the life of Joseph, does not have a toledoth signature. It ends with, “So Joseph died at the age of a hundred and ten. And after they embalmed him, he was placed in a coffin in Egypt.” How wonderful it would have been for this to end with, “this is the toledoth of Joseph’s son X” or something of that nature, but it simply doesn’t. And this too, unfortunately, has caused many to abandon the tablet theory altogether. There are several explanations that have been put forth to explain the absence of a toledoth phrase. Sewell speculates that a colophon of sorts appears in Ex. 1:6. This must be a conjecture, but I think that Exodus 1:6, “And Joseph died, and all his brethren, and all that generation.” could form this closure. It may have been added by Moses, after he inherited all the tablets, and began to combine them. Those last chapters of Genesis must have been primarily written by Joseph, but of course he couldn’t have recorded his own death. These few verses may have been written by one of his surviving brothers. While this is possible, I would suggest a much simpler explanation. Perhaps at the time and place it was written, colophons were no longer a standard literary practice. Think about how much history the book of Genesis covers. From creation to Joseph’s death, more than 2300 years had passed. Dozens of generations and cultures came and went, and it would seem likely that literary practices also came and went. The egyptians were known for engraving stone, but they also wrote on papyrus scrolls, which did not pose the same challenges as clay tablets. It just may be that this last document Moses used was written on a different medium, and at a time when colophons were not customary anymore. All points considered, the textual evidence seems to indicate that this last section in the book of Genesis does not include an introductory or concluding colophon. 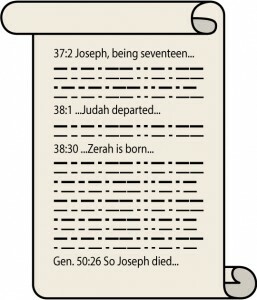 The account spans from Gen. 37:2 to Gen. 50:26, starting with Joseph at 17 and ending with his death and burial at 110. There is a possible embedded account in chapter 38 that seems to have no connection to the main account. It is the story of Judah and his daughter-in-law Tamar, spanning from Gen. 38:1-30. No markers are used to identify the author or owner of this account either. It would seem different literary devises were employed in this last account document. After reviewing the archeological and textual evidence, Wiseman’s Tablet Theory seems to provide invaluable insights toward solving the toledoth mystery. In all but 3 cases, the Genesis toledoth phrases which include a patriarch’s name are better understood as concluding signatures, rather than subject introductions. Only Ishmeal’s and Esau’s toledoth deviate, and are better understood as introductory signatures. But Sewell’s suggestion of ‘embedded accounts’ seems to adequately explain why this was necessary for these estranged sons. Furthermore, all the toledoth patriarchs would have been ideal witnesses to record the events in their accounts, being eyewitnesses themselves or having access to eyewitnesses. Wiseman’s theory also fits the absence of a human signature in the very first toledoth which accounts events no human could have witnessed. The implications of these findings are numerous. While mosaic authorship was never in doubt (due to the Biblical evidence, and solid historical tradition), the Tablet Theory not only affirms it, but explains the method Moses used under the guidance of the Holy Spirit. Genesis came to be the same way all other biblical narratives did—by the gathering of testimonies from reliable eyewitnesses, under the Spirit’s guidance. There is also tremendous apologetic value in Wiseman’s Hypothesis. While no one can be forced to accept any form of evidence, it is our duty to give those who ask well reasoned answers (1Pet. 3:15). (For more on this see our article, Should Christians engage in Creation Apologetics?) And even the most committed skeptics can see (if they so choose) how the witnesses of Genesis confirm its antiquity, authenticity and reliability. For while many will argue it’s not the oldest text in existence, we now have textual evidence based on archeology that it was composed from much older writings—even going back to the first man. It doesn’t get much more reliable than that. All in all, the Wiseman’s Tablet Theory holds up under scrutiny, and provides us with the best insights yet in understanding the structure and origins of Genesis. 1. The original Hebrew name for the book of Genesis is b-ray’sheeth, “in the beginning” named after the first word in the account. by Charles V Taylor, M.A., Ph.D., PGCE, LRAM, FIL, Cert. Theol. Original book by Air Commodor P. J. Wiseman, C.B.E.